The Georello Jungle is a classic example of why I don’t include listed age limits for toys and books; rather, I note developmental aspects of the item that would mesh with wherever your babe is at. This super cool toy is part puzzle, part color learning tool, part mechanics 101 lesson. 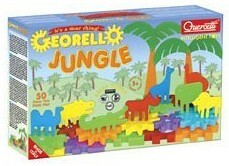 The Georello Jungle is the one toy in our house that garners play irrespective of age (e.g., 21 months to about 60 years!). Toddlers love locking the base puzzle pieces together and, as I recently discovered, matching the colors of the animals to the colors of the base pieces. Adults cannot resist attempting to construct super cool, spinning gear patterns. The 50-piece set includes base pieces, meshing gears, wild animals, and palm trees. I picked mine up at Henry Bear's Park (Huron Village, Arlington Center); also available at Amazon for $15.99.